The black exhaust end pipes deliver a fascinating and, at the same time, characteristic AMG eight-cylinder sound. The regulation rain lamp is integrated into the rear hatch – it must be switched on by the driver in poor weather conditions. As defined in the FIA GT3 regulations, the AMG 6.3 liter V8 engine is virtually identical to that of the series production vehicle. Thanks to its low weight, the acceleration figures for the GT3 – 3.7 seconds for the sprint from 0 to 60 mph – are considerably below the already excellent figures for the series production vehicle. Depending on gear ratio, the top speed is more than 186 mph. Dry sump lubrication also facilitates a low mounting position for the V8 power unit – one of the key technological highlights of the SLS AMG. The solution – installing the eight-cylinder as low as possible and as a front mid engine behind the front axle, combined with a transaxle transmission layout – results in excellent weight distribution. In contrast to the series production vehicle, the SLS AMG GT3 is equipped with a sixspeed racing transmission with sequential shift. Thanks to its compact construction, the race-tested transmission offers considerable packaging benefits – ultimately, the GT3 version has less ground clearance than the series production vehicle. The driver shifts gear using two shift paddles on the steering wheel. The transmission is mounted directly on the rear axle and connected to the V8 engine via a torque tube, which has a very high degree of flexural and torsional stiffness. This delivers considerable benefits when it comes to dynamics, as this sophisticated solution enables the entire driveline to be laid out with significantly less play. Alongside the traction control, a multi-plate locking differential integrated into the transmission delivers outstanding acceleration characteristics. Inside the torque tube, a drive shaft rotates at engine speed. As in the series production model, and in the Mercedes-Benz C-Class DTM touring car, the shaft is made from carbon fiber. 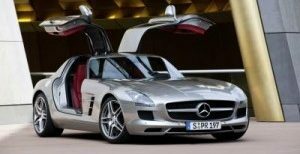 With its long wheelbase, low center of gravity and wide track, the SLS AMG vehicleconcept was predestined for the race track – its strengths include precise turn-in characteristics, first-class agility, low inertia under sudden changes of direction and a high cornering limit. Like the series production SLS AMG, the GT3 version is also equipped with rack and pinion steering with speed dependent power assistance. The more direct input ratio facilitates even greater handling agility on the race track. Shortest stopping distances, highest stability and optimal control are guaranteed by the AMG race braking system. All four corners feature brake discs in motorsport-tested composite technology. Gray cast iron axial and radial floating discs are fixed to an aluminum hat via stainless steel composite elements. This sophisticated technology enables perfect heat dissipation and thus reliable stability. The SLS AMG GT3 is also equipped with precisely calculated cooling channels – openings in the front skirt and ahead of the rear wheels direct cool airflow over the brake discs. All four brake discs are ventilated, slotted and drilled. Six-pot fixed calipers on the front axle and four-pot fixed calipers at the rear, finished in anthracite with the AMG logo in white, provide plenty of brake pad surface. An anti-lock brake system with special race track settings is fitted as standard. Due to space restrictions, the AMG high-performance ceramic composite brake system, available as an option on the series production vehicle, is not compatible with the 18-inch wheels prescribed by FIA regulations. The AMG center-locking alloy wheels – 12×18 inches front and 13×18 inches rear – are fitted with racing tires in formats 11.3 × 26.9 inches (front) and 12.4 × 27.9 inches (rear). Depending on the application, the tires are available as profile-free slicks, intermediates or wet weather tires. The classic multi-spoke design aids ventilation of the braking system. Fast pit stops and wheels changes are ensured by the pneumatic lift system integrated into the underbody. Four pneumatic rams raise the GT3 race car by around 7.5 inches, enabling the pit crew to change the racing tires in double quick time. A steering wheel with a diameter of 13 inches facilitates perfect vehicle control. Because it is open at the top, the driver always has a perfect view of the central display, which provides all relevant information such as road speed, engine speed, operating temperatures, lap times and gear selection. The steering wheel is fitted with a quickrelease mechanism that makes entering and exiting the vehicle considerably easier. The switches on the steering wheel hub enable the driver to activate additional functions such as the pit radio, headlamp flasher and the drink supply. Further operating elements are mounted on the center console and include the start/stop function for the AMG V8 engine, the traction control, reverse gear and – just in case – the integrated fire extinguisher. The control for adjusting brake balance is located on the torque tube tunnel. The close relationship between the GT3 and its series production sibling is demonstrated by the instrument cluster, with its powerfully taut wing profile providing visual breadth. Integrated into the dash are the highly distinctive air vents galvanized in “Silver Shadow” and with adjustable cross-shaped nozzles – their form evocative of a jet engine. The new SLS AMG GT3 has been developed in accordance with FIA GT3 regulations and is entitled to participate in all GT3 race series – including the popular 24-hour races in Spa-Francorchamps, Belgium, and on the Nürburgring in Germany. Interested customers can order the vehicle starting in autumn 2010, with delivery scheduled prior to the start of the 2011 racing season. Homologation will be completed in March 2011. Making its auto show debut in New York is the limited-edition 2011 SL550 Night Edition. Based on the iconic SL-Class coupe/roadster, the highlight of the SL550 Night Edition is its matte-finish designo magno night black paint and Black premium leather interior. Limited to just 100 units, this exclusive model will be available in U.S. showrooms in early 2010. The special designo magno night black paint finish — specially developed exclusively for the SL550 Night Edition — works particularly well with the dramatic design of the SL-Class. The Night Edition rolls on 19-inch AMG five-spoke light-alloy wheels in a twotone, high-gloss finish, silver-painted front brake calipers with “Mercedes-Benz” script and darkened headlamps/tail lights help distinguish the exclusive status of the SL550 Night Edition. The interior features a striking contrast of dark Black premium leather and bright chrome trim, with numerous fine details. The newly-designed seats have arrow-shaped seams and silver-colored contrasting features, while the sports steering wheel, shift lever and roof lining are trimmed in black. The trim strip of the wind-deflector has a high-gloss finish complimented by the silver-colored vents of the AIRSCARF® system, which bathes the driver in warm air when the convertible top is down during cooler weather. A direct descendant of the legendary 300SL “Gullwing” of the 1950s, the current SL roadster line-up features the V8-powered SL550 (382 horsepower, 391 lb.-ft. of torque) and the V12-powered SL600 (510 hp, 612 lb.-ft.) as well as the high-performance V8-powered SL63 AMG (518 hp, 465 lb.-ft.) and the V12-powered SL65 AMG (604 hp, 738lb.-ft.). Mercedes-Benz performed a comprehensive exterior redesign on the iconic SL roadster, which features dramatic styling with fenders that incorporate sharp, angular headlights and modified gill-type air outlets behind the front wheels. A front hood with two power domes and a bold single-lamella grille emphasize the width of the body and make a symbolic visual connection to the famous 1954 300SL, while larger side mirrors reveal built-in arrow-shaped turn signals. At the rear, the SL looks more aggressive than ever, with an air diffuser in the bumper that adds a motorsports touch, as well as trapezoidal exhaust tips that emphasize its width and suggest all the power on tap. The cockpit reveals a three-spoke multifunction steering wheel and an instrument cluster with eye-catching red tachometer and speedometer needles that swing to the max position and back to zero whenever the ignition is turned on. All Mercedes-Benz SL roadsters are available with AIRSCARF, an innovative feature that can extend the open-air driving season into the cooler months. Another first from Mercedes-Benz, AIRSCARF is an extra heating system built into the driver and passenger seats. At the touch of a button, warm air flows from vents in the head restraints, acting as an invisible scarf around the head and neck. Testing revealed that warming just a relatively small area around the neck dramatically improves comfort in cooler weather. The AIRSCARF neck-level heating system blows warm air from the head restraints of the driver and passenger seats, allowing occupants to cruise comfortably with the retractable hardtop open in cooler temperatures. AIRSCARF uses a heating element made primarily of barium titanate, which heats up in a matter of seconds when electrical current is applied. Its electrical resistance jumps once it’s heated, reducing the power needed – engineers call this balance “Positive Temperature Coefficient” or PTC for short. The PTC heater is only a few inches in size, allowing it to hide inside the SL seatback. Aluminum fins on the heater help transfer the heat to the air, and a small fan pushes the heated air through the vents in the head restraint. Standard on the SL600 and SL65 AMG models (and optional on the SL550 and SL63 AMG), the AIRSCARF neck-level heating system even compensates for changes in air temperature and vehicle speed. An electronic control module monitors data from inside and outside temperature sensors as well as the speedometer. AIRSCARF automatically adjusts fan speed based on this information, and a three-speed switch can override the automatic settings. The SL63 AMG has one of the most powerful naturally aspirated production V8s ever, boasting a wealth of exciting features derived from AMG’s highly successful racing efforts. Built almost completely from a high-strength silicon-aluminum alloy, the 518 hp engine features four valves per cylinder, variable valve timing, bucket-type cam followers (rather than rocker arms), and a variable intake manifold. That for sure is a chick magnet…what an awesome car to own.